Product information "Casio Celviano GP300 Grand Hybrid Digital Piano"
The GP300 is the perfect combination of innovation and tradition. Featuring 88 wooden keys made from high-quality Austrian spruce, 26 different tones a hall simulator that recreates the acoustic of world-class venues and a unique collaboration with C.Bechstein researching characteristics of three of the worlds finest grand pianos. The GP300 is perfect for the Intermediate player or those limited on space but want to practise with the depth and richness of a grand piano. Casio has developed a new revolutionary natural grand hammer action keyboard, giving the GP300 the authentic piano touch. The keyboard features 88 full-length wooden keys made from high-quality Austrian spruce using the same manufacturing process found in C.Bechstein Concert grand pianos. A keypress sends a hammer along the same vertical path as a grand piano, with the same essential weighting and pivot points, resulting in a true and uncompromising piano touch. Casio's GP300 new AiR Grand Source provides three of the worlds finest grand's. Handsomely named the Berlin, Hamburg and Vienna Grands, each one is the result of countless hours of precise analysis and study of their unique characteristics. They are faithful and expressive recreations of these distinctive pianos. The Berlin Grand has a balanced and elegant sound, ideal for playing impressionistic music. The Vienna Grand has a brilliant rich sound, loved for its wide range of expression. The Hamburg Grand has an impressive low range of warm tone, great for both soft and vigorous playing. The GP300 benefits from a six-speaker amplification system, which is effective at providing a wholesome, rich sound. The Grand Acoustic System delivers three dimensional sound, which leaves it closely reminiscent of a truly acoustic grand piano. By having the speakers face three directions, the GP300 can comfortably deliver classic sound to both the musician and the audience. This Casio product comes with a generous five-year warranty. This protects your piano in parts and labor costs for any manufacturing fault. This is an ‘on-site’ warranty, so a registered technician will come to the piano’s residence for any repairs. 88 full-length wooden keys, as found in an acoustic grand piano. 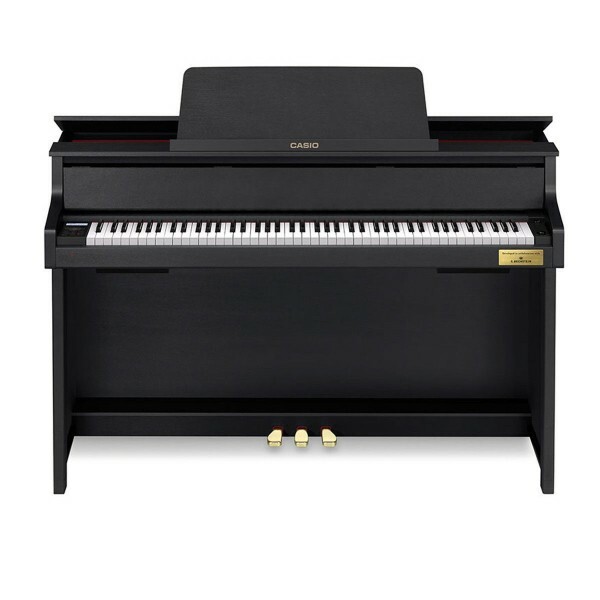 Related links to "Casio Celviano GP300 Grand Hybrid Digital Piano"
Customer evaluation for "Casio Celviano GP300 Grand Hybrid Digital Piano"